^ The Abbasid Revolution against the Umayyad Caliphate adopted black for its rāyaʾ for which their partisans were called the musawwids. Tabari (1995), Jane McAuliffe (ed. ), Abbāsid Authority Affirmed, 28, SUNY, p. 124 Their rivals chose other colours in reaction; among these, forces loyal to Marwan II adopted red. Patricia Crone (2012). The Nativist Prophets of Early Islam. p. 122. . The choice of black as the colour of the Abbasid Revolution was already motivated by the "black standards out of Khorasan" tradition associated with the Mahdi. The contrast of white vs. black as the Umayyad vs. Abbasid dynastic colour over time developed in white as the colour of Shia Islam and black as the colour of Sunni Islam: "The proselytes of the ʿAbbasid revolution took full advantage of the eschatological expectations raised by black banners in their campaign to undermine the Umayyad dynasty from within. 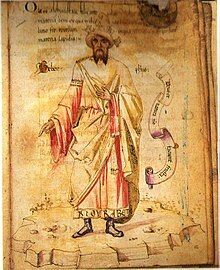 Even after the ʿAbbasids had triumphed over the Umayyads in 750, they continued to deploy black as their dynastic colour; not only the banners but the headdresses and garments of the ʿAbbasid caliphs were black [...] The ubiquitous black created a striking contrast with the banners and dynastic color of the Umayyads, which had been white [...] The Ismaili Shiʿite counter-caliphate founded by the Fatimids took white as its dynastic color, creating a visual contrast to the ʿAbbasid enemy [...] white became the Shiʿite color, in deliberate opposition to the black of the ʿAbbasid 'establishment'." Jane Hathaway, A Tale of Two Factions: Myth, Memory, and Identity in Ottoman Egypt and Yemen, 2012, p. 97f. After the revolution, Islamic apocalyptic circles admitted that the Abbasid banners would be black but asserted that the Mahdi's standard would be black and larger. David Cook (2002). Studies in Muslim Apocalyptic, p. 153. Anti-Abbasid circles cursed "the black banners from the East", "first and last". Patricia Crone (2012). 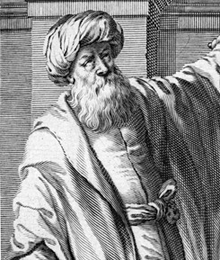 The Nativist Prophets of Early Islam. p. 243. ^ Finer, S. E. (1 January 1999). The History of Government from the Earliest Times: Volume II: The Intermediate Ages p.720. OUP Oxford. ISBN 9780198207900. Bonner, Michael (2010). 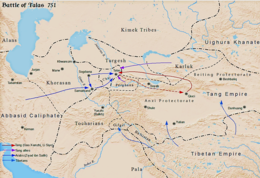 "The Waning of Empire: 861–945". In Robinson, Charles F. (ed.). The New Cambridge History of Islam. I: The Formation of the Islamic World: Sixth to Eleventh Centuries. Cambridge, UK: Cambridge University Press. pp. 305–359. ISBN 978-0-521-83823-8. Brinkley, Frank (1902). Trübner (ed.). China: Its History, Arts and Literature. Oriental. X. Boston, MA: J. B. Millet Company. Clinton, Jerome W. (2000). Talattof, Kamran; Clinton, Jerome W. (eds.). The Poetry of Nizami Ganjavi: Knowledge, Love, and Rhetoric. Houndmills, UK: Palgrave Macmillan. ISBN 0-3122-2810-4. LCCN 99056710. Dimand, Maurice S. (1969). "Islamic Glass and Crystal". In Myers, Bernard S.; Myers, Shirley D. (eds.). McGraw-Hill Dictionary of Art. 3: Greece to Master F. V. B. New York, NY: McGraw-Hill Book Company. LCCN 68026314. Dimand, Maurice S. (1969a). 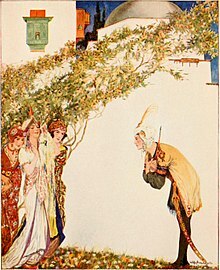 "Islamic Painting". In Myers, Bernard S.; Myers, Shirley D. (eds.). McGraw-Hill Dictionary of Art. 3: Greece to Master F. V. B. New York, NY: McGraw-Hill Book Company. pp. 205–211. LCCN 68026314. Dimand, Maurice S. (1969b). "Islamic Pottery and Tiles". In Myers, Bernard S.; Myers, Shirley D. (eds.). McGraw-Hill Dictionary of Art. 3: Greece to Master F. V. B. New York, NY: McGraw-Hill Book Company. pp. 211–216. LCCN 68026314. Dimand, Maurice S. (1969c). "Islamic Textiles". In Myers, Bernard S.; Myers, Shirley D. (eds.). McGraw-Hill Dictionary of Art. 3: Greece to Master F. V. B. New York, NY: McGraw-Hill Book Company. pp. 216–220. LCCN 68026314. El-Hibri, Tayeb (2011). "The empire in Iraq: 763–861". In Robinson, Chase F. (ed.). The New Cambridge History of Islam. 1: The Formation of the Islamic World: Sixth to Eleventh Centuries. Cambridge, UK: Cambridge University Press. pp. 269–304. ISBN 978-0-521-83823-8. Gibb, Hamilton Alexander Rosskeen (1982) . Shaw, Stanford J.; Polk, William R. (eds.). Studies on the Civilization of Islam. Princeton University Press. ISBN 0-691-05354-5. Kennedy, Hugh (1990). 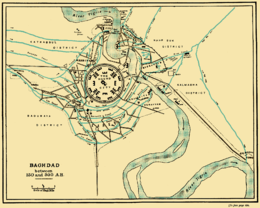 "The ʿAbbasid caliphate: a historical introduction". In Ashtiany, Julia; Johnstone, T. M.; Latham, J. D.; Serjeant, R. B.; Smith, G. Rex (eds.). ʿAbbasid Belles Lettres. The Cambridge History of Arabic Literature. Cambridge: Cambridge University Press. pp. 1–15. ISBN 0-521-24016-6. Lewis, Bernard (1995). "The Middle East". In Holt, Peter M.; Lambton, Ann K. S.; Lewis, Bernard (eds.). The Cambridge History of Iran. 1A. Cambridge, UK: Cambridge University Press. ISBN 978-0-5212-9135-4. Mottahedeh, Roy (1975). "The ʿAbbāsid Caliphate in Iran". In Frye, R. N. (ed.). The Cambridge History of Iran. 4: From the Arab Invasion to the Saljuqs. Cambridge, UK: Cambridge University Press. pp. 57–90. ISBN 978-0-521-20093-6. Pavlidis, T. (2010). "11: Turks and Byzantine Decline". In Goldschmidt Jr., Arthur; Davidson, Lawrence (eds.). A Concise History of the Middle East (9th ed.). Boulder, CO: Westview Press. ISBN 0-8133-4388-7. LCCN 2009005664. Sourdel, D. (1970). "The ʿAbbasid Caliphate". In Holt, P. M.; Lambton, Ann K. S.; Lewis, Bernard (eds.). The Cambridge History of Islam. 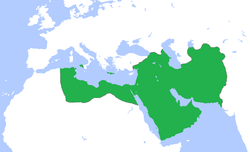 1A: The Central Islamic Lands from Pre-Islamic Times to the First World War. Cambridge: Cambridge University Press. pp. 104–139. ISBN 978-0-521-21946-4. Wade, Geoffrey (2012). "Southeast Asian Islam and Southern China in the Fourteenth Century". In Wade, Geoff; Tana, Li (eds.). Anthony Reid and the Study of the Southeast Asian Past. Singapore: Institute of Southeast Asian Studies. Wilber, Donald N. (1969). "Abbasid Architecture". In Myers, Bernard S.; Myers, Shirley D. (eds.). McGraw-Hill Dictionary of Art. 1: Aa-Ceylon. New York, NY: McGraw-Hill Book Company. LCCN 68026314.